President Trump has long threatened to impose a tax on remittances to Mexico to pay for a wall along the U.S.-Mexico border. We won’t get into the politics surrounding such a hot button issue, but it raises an important issue about just how much money gets sent from the U.S. to other countries. Answering that question formed the basis for our newest map. Our map was inspired by the Pew Research Center, which gathered data from economists at the World Bank. The numbers reflect cash flows in 2016 leaving the U.S. to people in other countries through official channels, like a bank or wire transfer service. The data exclude cash flows through informal networks—think of sending cash through the mail—which economists suspect might add up to 50% to these totals. We placed the official statistics on a bubble chart, where the size of the circle corresponds to the total annual remittance for each country. We then color-coded each continent and included a percentage for easy reference. Our creative approach lends itself to several quick insights into global remittances leaving the U.S.
First off, the Americas and Asia receive the majority of remittance payments, accounting for 42% and 39.8% of the total global cash flow, respectively. Europe, Africa and Australia and Oceana receive very little money in comparison. Mexico ($28.1B), China ($15.4B), India ($10.7B) and the Philippines ($10.5B) immediately stand out as the top four countries, making up a combined $64.7B in annual remittances, or almost half the entire market (47%, combined). There are a lot of other interesting trends within each continent too. Generally speaking, remittances are not evenly spread out between countries—a select few dominate the market. Mexico is the obvious stand out in the Americas, but that’s probably because of its physical proximity to the U.S. Instead, take a look at the Dominican Republic ($4.1B). Combined with Haiti ($1.4B), this one island would crack the top ten destinations for cash leaving the U.S. 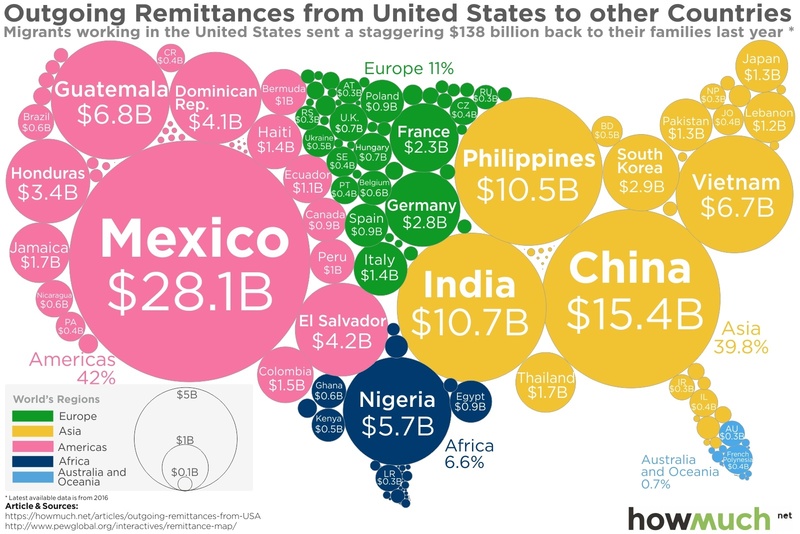 But just how big is the market for remittances to Mexico (at $28.1B? It’s at an all-time high right now, and represents the equivalent of the entire economy of Paraguay. In other words, there’s an enormous transfer of wealth happening year after year. There’s a similar pattern on other continents too, where a select few countries receive a disproportionate share of remittances. Look at Africa, where Nigeria pulls in $5.7B every year. Or consider Europe, where Germany ($2.8B), France ($2.3B) and Italy ($1.4B) are the only three countries breaking the $1 billion mark. Things look similar in Asia, where four different countries receive more than $5 billion on an annual basis; every other country lags far behind. In short, a few key countries dominate the market. We can summarize our map of remittances like this: when it rains, it pours. Cash flows accrue at different rates for different countries, and a select few tend to dominate the market. We can speculate about why this happens—perhaps once an immigrant population starts sending money, businesses spring up to facilitate the transfers, making it easier for more money to go overseas. Regardless, the flow of money is so large that taxing it will likely carry enormous economic consequences.